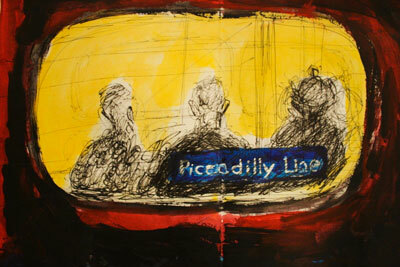 This year I will be showing drawings I have been doing on the London Underground. 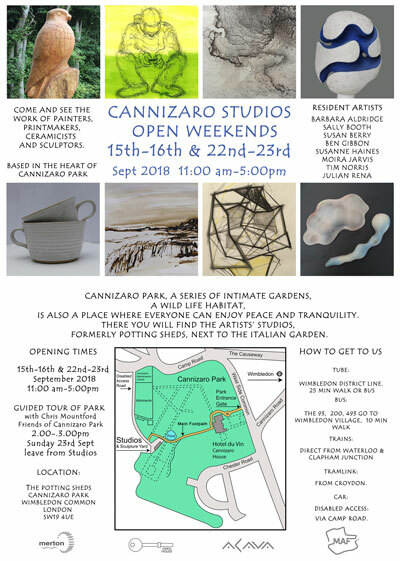 We are again part of the Merton Arts Festival and Open House Weekend this year. 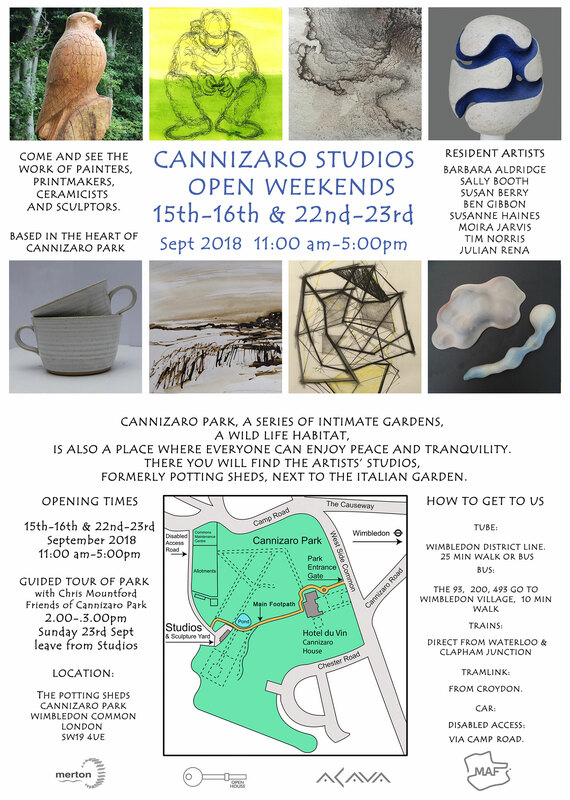 Exhibition open every day 28 September to 7 October 2018, 10:00am - 5:00pm. Late night opening Thursday 4 October. Visit www.projectlight.world for details of special events and how to get involved. Should we assume that light is required to experience vision? I am one of the artists who has been invited to take part in this exhibition which includes exploring creative description of imaginary art works. Shared Vision is a new exhibition of commissioned works from sighted, partially-sighted and blind artists. The works include film, sculpture, painting, texts, audio works and photography. They explore how stories of vision, or lack of it, can affect and transform people’s lives. By investigating the ways in which we ‘see’, the works invite us to consider other ways of experiencing our world. All the artist details on this page of the website). 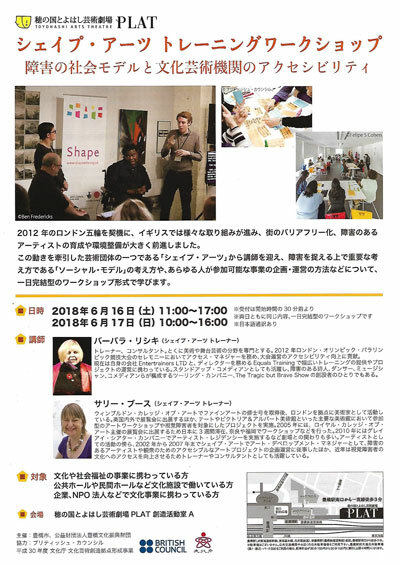 In June I was invited by Shape Arts to go to Japan to co-facilitate training workshops at a number of cultural venues. The programme was hosted by the British Council in Japan. 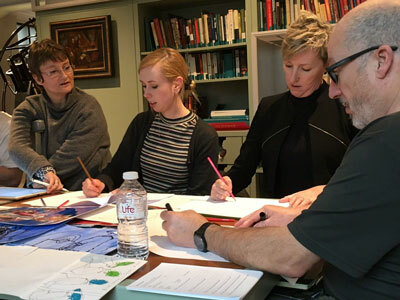 With trainer Barbara Lisicki, we delivered Disability Equality, Accessible Events and Inclusive Practice training at Tokyo Metropolitan Museum, Edo Tokyo Museum, British Council Tokyo and Toyohashi Arts Theatre PLAT. Dates: Thursday 22 March-Thursday 5 April 2018, 10am to 6pm every day except Mondays and Easter Sunday. Working in collaboration with other visually impaired artists at Yinka Shonibare's Guest Projects during Oct/Nov 2017 gave me the time to experiment and provided mutual encouragement to begin and display a new body of work. 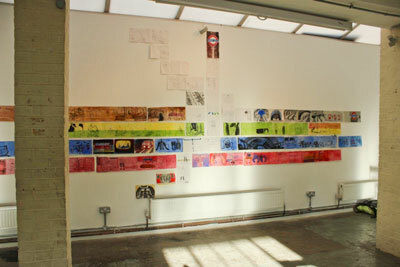 The drawings shown here are examples of sketches that were part of a drawing installation shown at the studio. They form part of a larger series I am currently undertaking on the London Underground. 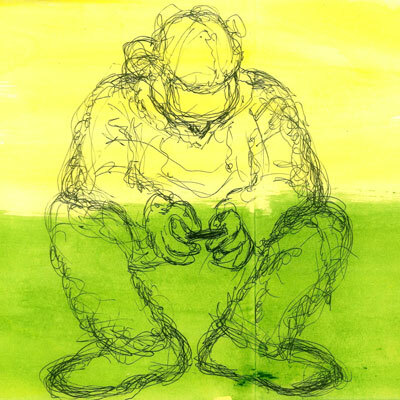 Fast and furious, these drawings are often made over one or two stops and capture moments of everyday life across each line of the network, a city under ground. 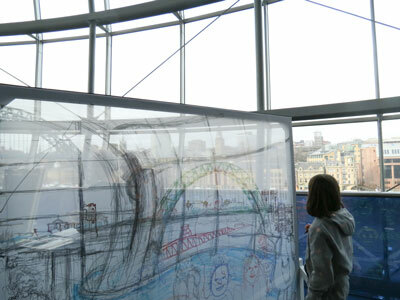 As part of Radio 3's Free Thinking Festival, I will be undertaking a live participatory drawing installation in Foster's exciting and expansive space in Gateshead on Saturday 10th and Sunday 11th March. 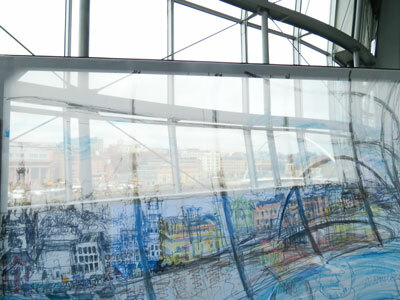 The venue will provide inspiration for drawings which include the activity and architecture of the building, and its spectacular views of the Tyne. 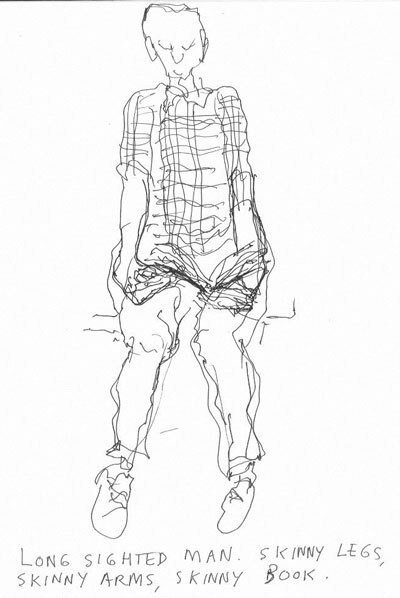 The public will be invited to add layers to my drawings, linking in with the main theme of the festival - the relationship between the individual and the crowd. 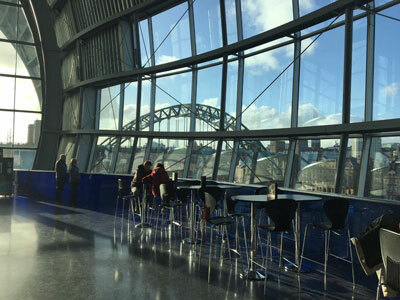 BBC Radio 3’s Free Thinking Festival takes place at Sage Gateshead from Friday 9 – Sunday 11 March 2018. This year’s Free Thinking Festival is a chance to examine the fast-changing relationship between the individual and the crowd. The festival brings together leading thinkers for a free weekend of provocative debate, new ideas, music and performance. Working in collaboration with artists Tanya Raabe and Tony Heaton, I was invited to facilitate a participatory arts event. 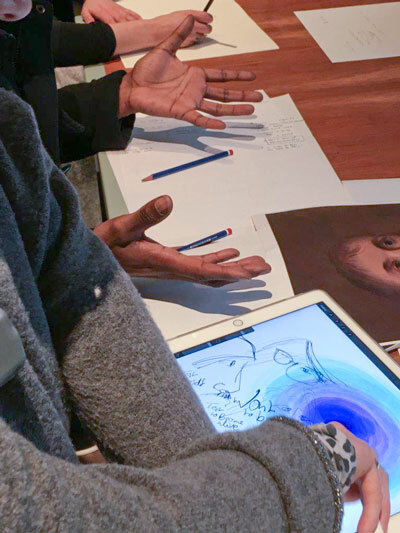 Through drawing and discussion, we used examples from the Wellcome Collection to explore experiences of tests and assessments. Have a look at previous years news from 2017, 2016, 2015, 2014, 2013, 2012, 2011, 2010, 2009, 2008, 2007 and 2006.